Duke Paoa Kahanamoku : Riding the Surfboard, 1911. Kahanamoku, Duke Paoa: Riding the Surfboard, Part 1. Volume 1, Number 1, January,1911, pages 2 to 10. 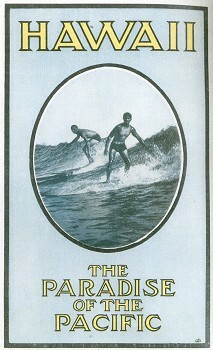 This first issue of The Mid-Pacific Magazine was subtitled the "Surfing and Coastal Number" and surf riding predominates the publication with numerous photographs including the cover and back page, see below. Although the following article is formally attributed to Duke Paoa (Kahanamoku), the introductory remarks are considerably less specific: "Duke and the members of the Hui Nalu ... have supplied the material." In what is possibly the earliest published reference to the Hui Nalu, it is as designated as "an organization of professional surfers." In July 1911, the Hui Nalu, was admitted to the local branch of the A.A.U. and described in the Honolulu press as "Waiklki rowers and swimmers, composed chiefly of Hawalians,"
Kahanamoku, Vincent Genoves, Kenneth Winter and Curtis Hustace. "Ford is clearly the author of the article. The Mid-Pacific was his magazine, and surfing his pet project. If we needed further proof, we could look to his correspondence (housed in the Huntington Museum) with Jack and Charmian London, some fifteen letters in all that detail his troubles running the magazine. On January 10th, 1913, he wrote: ‘I . . . write half the articles myself under assumed names, and beg, borrow or steal the others.’"
- Patrick Moser: Revival, Kurungabaa. Posted on February 25, 2011 by Clifton Evers, viewed 24 June 2012. Unfortunately, a large section of the text reproduces sections of an article from Thrum's Hawaiian Almanac and Annual for 1896, which despite Kahamoku's recommendation as "the best article ever prepared on ancient surfing", has a number of significant difficulties. The initial surfriding image is accredited to A.R. Gurrey Jr. who was one of the first to excel at surf photography. Note the photograph on page 133 (below) of the Pioneer Adv. 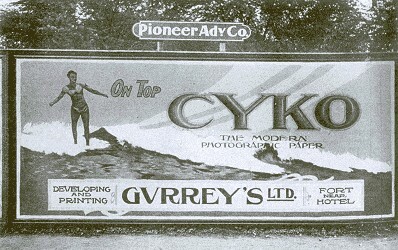 Company billboard for "CYKO -The Modern Photographic Paper" available at Gurrey's Ltd. This page, Bill Boards in Honolulu, was regularly reproduced in subsequent editions. The issue also featured an article on skiing in Australia that made brief mention of surfboard riding at Manly in Sydney. 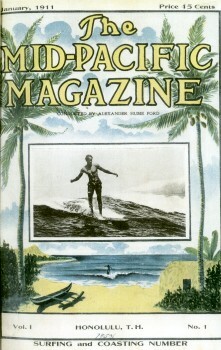 During the next decade The Mid-Pacific Magazine printed a large number of surfboard and canoe surfing articles and photographs. Copyright 1910 A.R. Gurrey Jr.
spent half of his waking hours from early childhood battling the waves for sport. have supplied the material for this article on the national sport of Hawaii. I have never coasted down a hill of frozen rain, but every day of the year, where the water is 76, day and night, and the waves roll high, I take my sled, without runners, and coast down the face of the big waves that roll in at Waikik!. speed, in graceful attitude, of course, until you reach the beach and step easily from the wave to the strand? Find the locality, as we Hawaiians did,- here the rollers are long in forming, slow to break, and then run for a great distance over a flat, level bottom, and the rest is possible. Here centuries ago was born the sport of running foot races upon the crests of the billows, and here bronze skinned men and women vie today with the white man for honors in aquatic sports once exclusively Hawaiian, but in which the white man now rivals the native. I mastered the art of riding the surf-board in the warm Hawaiian waters when I was a very small child, and I never gaze out upon the ocean in any part of the island that I do not figure out how far each wave, as it comes rolling in, would carry me standing on its crest. There are great, long, regular, sweeping billows, after a storm at Waikiki that have carried me from more than a mile out at sea right up to the beach; there are rollers after a big kona storm that sweep across Hilo Bay, on the Big Island of Hawaii, and carry native surfboard riders five miles at a run, and on the Island of Niihau there are even more wonderful surfboard feats performed. ... would come in standing on one leg, for, of course, the bigger and bulkier the surfboard the farther it will go on the dying rollers; but it is harder to start the big board, and, of course, on the big logs one man, the rear one, always had to keep lying down to steer the log straight with his legs. I have tried riding in standing on a seven-foot board , with a boy seated on my shoulders, and now I find it not impossible to have one of my grown companions leap from his board, while it is going full speed, to mine, and then clamber up and twine his legs about my neck. Among the favorite pastimes of ancient Hawaiians that of surfriding was a most prominent and popular one with all classes. In favored localities throughout the group for the practice and exhibition of the sport, "high car- nival" was frequently held at the spirited contests between rivals in this aquatic sport, to witness which the people would gather from near and far; especially if a famous surf-rider from another district, or island, was seeking to wrest honors from their own champion. Native legends abound with the exploits of those who attained distinction among their fellows by their skill and daring in this sport; indulged in alike by both sexes. Necessary work for the maintenance of the family, such as farming, fishing, mat and kapa making and such other house- hold duties required and needing attention, by either head of the family were often neglected for the prosecution of the sport. Betting was made an accompaniment thereof, both by the chiefs and the common people. George: Surfing Life (1990) page 20. ... according to the outcome of the match in the waves. There were only three kinds of trees known to be used for making boards for surfriding, viz. : the wiliwili (Erythrina monosperma), ulu, or bread-fruit (Artocarpus incisa), and koa (Acacia koa). Coral of the corrugated variety, termed pohaku puna, which could be gathered in abundance along the sea beach, and a rough kind of stone called 'oahi, were the commonly used articles for reducing and smoothing the rough surfaces of the board until all marks of the stone adze were obliterated. As a finishing stain the root of the ti plant (Cordyline terminalis), called mole ki, or the pounded bark of the kukui (Aleurites moluccana), called hili, was the mordant used for a paint, made with the root of burned kukui nut. This furnished a durable glossy black finish, far preferable to that made with the ashes of burned cane leaves, or amau fern, which had neither body nor gloss. 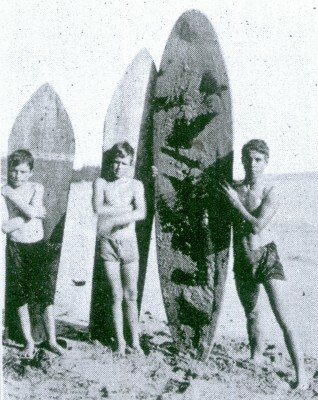 Before using the board there were other rites or ceremonies to be performed for its dedication, and, among those who followed the making of surf-boards as a trade, they were religiously observed. There are two kinds of boards for surfriding; one is called the olo and the other the a-la-ia, known also as i omo. The olo was made of wiliwili- a very light, buoyant wood-some three fathoms long, two to three feet wide, and from six to eight inches thick along the middle of the board, lengthwise, but rounding toward the edges on both upper and lower sides. It is well known that the olo was only for the use of the chiefs; none of the common people used it. They used the a-la-ia, which was made of koa, or ulu. Its length and width was similar to the olo, except in thickness, it being but of one and a half to two inches thick along its center. Any place nearer or closer in where the surf rises and breaks again, as it sometimes does, is called the ahua, known also as kipapa or puao. There are only two kinds of surf in which riding is indulged; these are called kakala, known also as lauloa, or long surf, and the ohu, sometimes called opuu. The former is a surf that rises, covering the whole distance from one end of a beach to the other. This, at times, forms in successive waves that roll in with high, threatening crest, finally falling over bodily. This is considered the best, being low and smooth and the riding thereon easy and pleasant, and is therefore preferred by ordinary surf-riders. The lower portion of the breaker is called honua, or foundation, and the portion near a cresting wave is tremed the muku side, while the distant, or clear side, as some have expressed it, is known as the lala. During calm weather, when there was 'no surf, there were two ",ways of making or coaxing it practiced by the ancient Hawaiians, the generally adopted method being for a swimming party to take several strands of the sea convolvulus vine and swinging it around the head lash it down unitedly upon the water until the desired result was obtained. The swimmer, taking position at the line of breakers waits for the proper surf. If the second comber is seen to be a good one, it is sometimes taken, but usually the third or fourth is the best, both from the regularity of its breaking and the foam calmed surface of the sea through the travel of its predecessors. A Small Boy Paddling Out on a Big Board. ... to land himself high and dry on the beach, or dismount on nearing it, as he may elect. 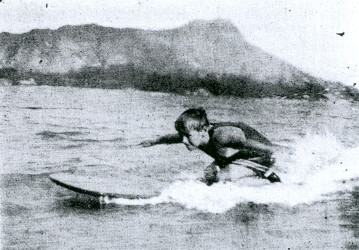 Kaha nalu is the term used for surf- swimming without the use of the board, and was done with the body only. The swimmer, as with a board, would go out for the position and, watching his opportunity, would strike out with ha;nds and feet to obtain headway as the approaching comber with its breaking crest would catch him, and with his rapid swimming powers bear him onward with swift momentum" the body being submerged in the foam; the head and shoulders only being seen. ... largely from the writings of others, as I am not a writer myself, but know when I read a description of surfing whether or not it is correct. It is at its best when the rollers are long in forming, slow to break, and, after they do, run for a great distance over a flat, level bottom, such as the coral beds at Waikiki, which is perhaps the all-year-round ideal surfboarding bit of water in the whole world. There are three surfs at Waikiki: the "big surf" toward Diamond Head, in front of Queen Liliuokalani's summer residence, where the most expert surf-board riders and the native boys disport themselves; the "canoe" surf, nearly in front of the Moana Hotel, where the majority of those who stand on the board dispute rights with the outrigger canoes that come sliding in from a mile out at sea before the monster rollers; and the beginners, or cornucopia surf - a series of gentle rollers before the Outrigger Canoe Club's grounds and the Seaside Hotel. The water for several hundred yards out is but waist deep, so that the malihini (new-comer) can stand beside his board, wait for a wave, give his board a forward push, jump on, and race in toward the beach before the foaming crest. There you have no foothold from which to gain a start, which must now be given the board by the power of the hands. It is half a mile out to the big waves, or "nalu nui," and a long "hoe," as the overhand windmill stroke that takes you out is termed. Then begins that constant, steady, windmill movement of the arms, the hands acting as paddles, and the six or seven-foot plank of light wood swiftly glides out to sea. ... board seem to cut through the flesh. Perseverance, however, overcomes all obstacles, and after a few days new muscle is developed and the stiffness is forgotten. Out in the deep surf, the board goes outward under the waves, a diving tip being given the board just as it bucks each onrushing breaker. It is coming onward, a great green roller with a ridge of almost imperceptible spray along its entire length. It was on account of this injustice to the small boy that the Outrigger Club was formed in April, 1908. 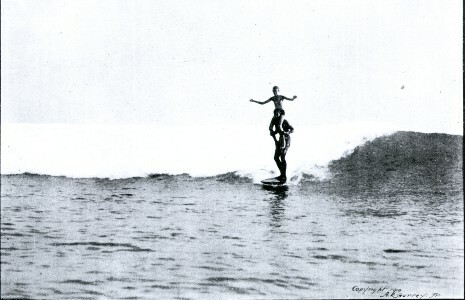 New members were taught to ride standing upon the surfboard, and so popular became the revival of the old Hawaiian sport that even the ladies began to take a deep interest in it. ... roughest waves are accomplishments beyond the acquirement of the "haole" or white man. 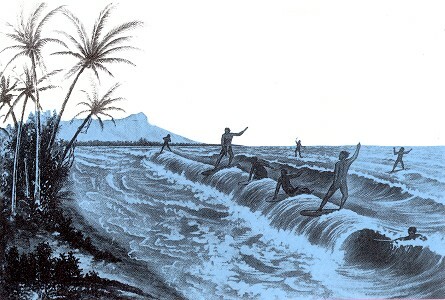 He describes in vivid pen pictures the Hawaiian boys and girls who danced upon the tips of the biggest breakers, and how his board, started by a big kanaka, caught a wave and shot with express speed toward the beach, while he shot with equal rapidity down toward the coral bed beneath the waters of Waikiki bay. Reproduced in many subsequent editions. Geoff Cater (2011-2019) : Duke Kahanamoku : Riding the Surfboard, 1911.